A south Derry motorist who accelerated away from police after performing a handbrake turn at a junction, has lost his licence for 15 months. Aidan Sean Lagan (20), mechanical engineering student, of Fivemilestraight, Maghera, was fined a total of £265 for dangerous driving and failing to stop for police. The court heard the incident happened between Disert Road and Cahore Road, Draperstown, on the afternoon of May 7 this year. 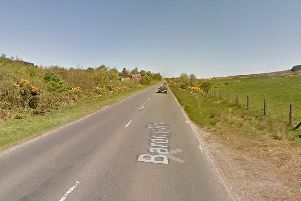 District Judge Alan White described it as “a shocking piece of driving” which could have resulted in a serious accident. A prosecuting lawyer said at about 5.20pm police spotted the car, with four males on board, performing the handbrake turn and almost turn over as it sped off from the liveried police vehicle. She said it sped through Straw village, overtaking vehicles and reaching speeds of 85mph, while pursued by police who signaled for it to stop. Counsel said the defendant’s car pulled away from the police vehicle, missing an oncoming vehicle. Police decided to terminate the chase when they noticed people walking on the roadway, she added. Defence solicitor Stephen Atherton said there was no excuse for the defendant’s driving, but he had cooperated later with police presenting himself for interview. He said there had been older friends in the car who he would say told him not to stop for the police. He added Lagan would miss his licence as he studied in Omagh.